Not everything has been turned around but most have had wonderful outcomes for the people involved. A child suffering from migraines who eliminated additives, preservatives and amines and a teenager with eczema sufferer who went on an elimination diet to uncover food intolerances and/or allergies were the most clear cut and had fantastic outcomes. But I don't think that they are infallible, especially with relation to the twins fighting breast cancer but on whole the programme is definitely worth a watch! There are also expos on the scientific use of vitamin supplements, sports drinks, superfoods and detox diets being genuine or just marketing ploys. Again, I don’t think that the baby should be thrown out with the bath water particularly in relation to the detox diets, i think that it is easy to berate a low quality detox product and say that your body can deal with everything, which I’m sure is true but not everybody’s body is up to scratch for the task and the body wasn’t originally intended to take in the amount of chemical that it does in the modern day. I would also like them to investigate a high quality detox kit such as Vogels, which is not just magnesium stearate (a laxative). if you want to loose weight and need motivation to do so, watch episode 4 with Tristan where they explain how little it takes to gain 1 pound over 10 days and 2 stone over 1 year by continuing the same eating..and what that fat looks like - yikes! I’m glad to have that in my mind as we come into the Christmas season!! And how was India you ask? ..Well, it was a crazy place. It was interesting and ugly and beautiful and fun and upsetting and glorious and filthy almost always at the same time! I had a couple (thankfully minor) food allergy slip ups but all in all things were easier than I had anticipated. I also fell upon two diamonds in the rough which I’ll tell you all about. I like Indian food as much as the next person but I’m not likely to wave flags and promote the stuff to every passer-by. Too much deep frying even though I LOVE the breads (Gluten Free was not my 1st priority, although it is very possible with a whole range of Wheat Free and Gluten Free flours in general use) My main concern was to not get sick and stay away from milk. I also wanted to stay away from eggs and meat which was a cinch! All I had to do was follow what they refer to as ‘strict vegetarian’ and then eggs where nowhere in sight. The milk, if you remember, was my worry. The infamous ghee and paneer and butter and curd hiding in every corner. But I found that if we ate at ‘cheaper’ places ghee was seldom used, do to its notorious expense (yay!!) and paneer was almost always listed in the title on the menu. Curd and butter were a bit trickier... a lot of imaginative questions were required to work your way around the answers. If you are thinking of travelling to India my best advice would be to do a lot of research on Indian food, what it is and what it’s made of. Just read a lot of recipes and you will be that much ahead of the game. F’s knowledge saved me on a couple occasions. Most important: ALL the desserts have dairy... every last one of them. Even if you ask, and they say no milk, no butter ask if they have ghee or curd etc. and at the end of the list you will always find a yes. However, if you are just DYING for a mango lassi or some type of sweet to pass your lips I did happen upon two unexpected diamonds. Honey and Spice (Laxmi Market, off Sadar Bazaar) served Soya based Lassi's! Alleluia! Happy Cow had a few vegan restaurants listed on it’s website but I couldn’t find my way to the German Bakery in Pushkar because EVERYTHING said German Bakery and everything was most certainly NOT Vegan (milk abounded) although the Sunset Café (just follow the signs down to the lake) served my needs well. p.s. I’m still fairly jet lagged and haven’t slipped back into my normal schedule yet so excuse me if my posts take a while to get back into the swing of things! 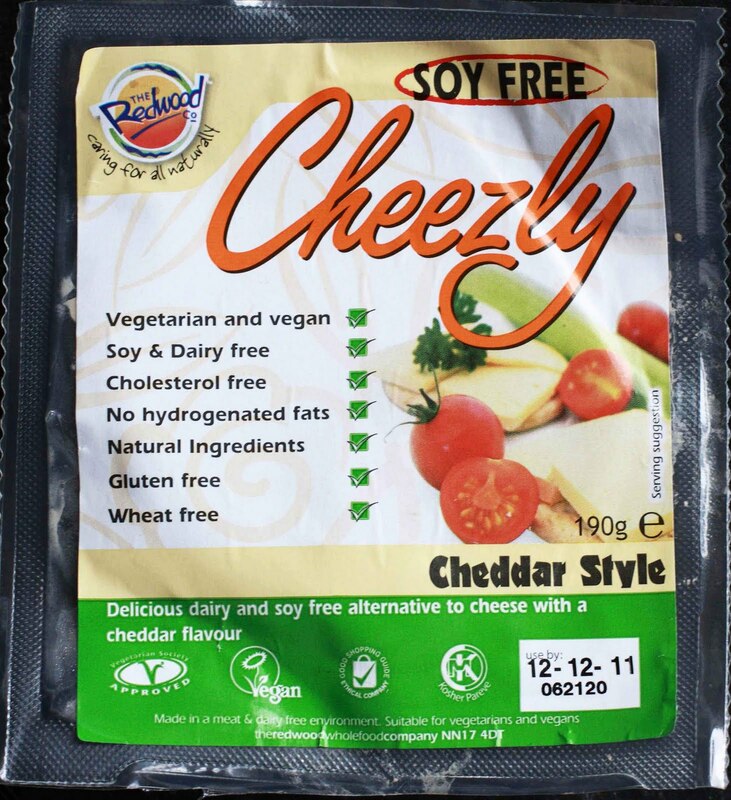 The most popular/available brands available in Dublin are Cheezly, Sheese and Tofutti. In my opinion, this, the original Cheezly Cheddar Style block is the best. It is the least vinegary, has the most appropriate texture and melts the best (the photos below don't represent this accurately due to poor light and a shortage of time!). There is still some dryness to the taste but the slices, once melted, blend a bit more and cling on to the bread better than the competition, although they are still prone to falling off in one piece. Tastes good raw with mayonnaise, salt and white pepper in a sandwich. An alright attempt. 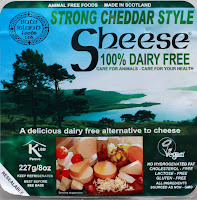 The block is a bit too soft to really resemble cheddar and the vinegar is a bit too heavy but it is the best, if not only, soy free cheese I have found in Ireland. 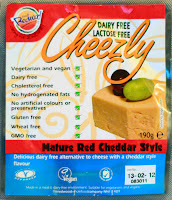 This cheese substitute is OK, despite its horrible name that reminds me of noses and wet sneezes. Sheese is dedicated to veganism and is making its way on the Irish market as a genuine competitor to Cheezly but in my opinion they still stand at second. 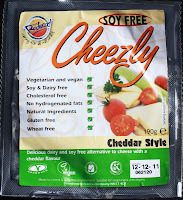 The cheese doesn’t melt as well as Cheezly (which lacks meltability itself) and tastes a bit ‘dry’ (even more than Cheezly). As almost a rule with Cheese substitutes, Sheese is too heavy on the vinegar but is overall a passable substitute that is better eaten raw than grilled or melted. Ingredients: Filtered Water, Vegetable Oil, Soya Concentrate, Salt, Spirit Vinegar, Flavourings, Oat Fibre (gluten-free), Lactic Acid (dairy-free), Thickeners: Carrageenan & Xanthan Gum, Yeast Extract, Colours: Curcumin (U.S.A Turmeric) & Annatto. Tofutti’s frozen desserts are good and their cream cheese substitutes are amazingly good and quite realistic but their mozzarella style cheese block completely confuses me. I think that it is the worst cheese substitute on the market. It is drowned in vinegar. Its too soft to cut, therefore acting as a spreadable cheese and when melted it almost turns to liquid, sliding right off the bread if you make grilled cheese. I have a wonderful ability to finish eating almost anything, no matter how bad it tastes, but I couldn’t finish this. Heated, cooled or cold the vinegar and the overall taste was unbearable to my palate. I advise sticking to Tofutti’s top quality cream cheese. Almost every health food shop stock their cream cheeses... but if you don’t want to take my word for it you can get some Tofutti Mozzarella Style Cheese substitute in the Field & Vine, Rathmines for €2.30 (note: I suspect, but cannot guarantee the “Mozzarella Style” cheese block to be Gluten Free). 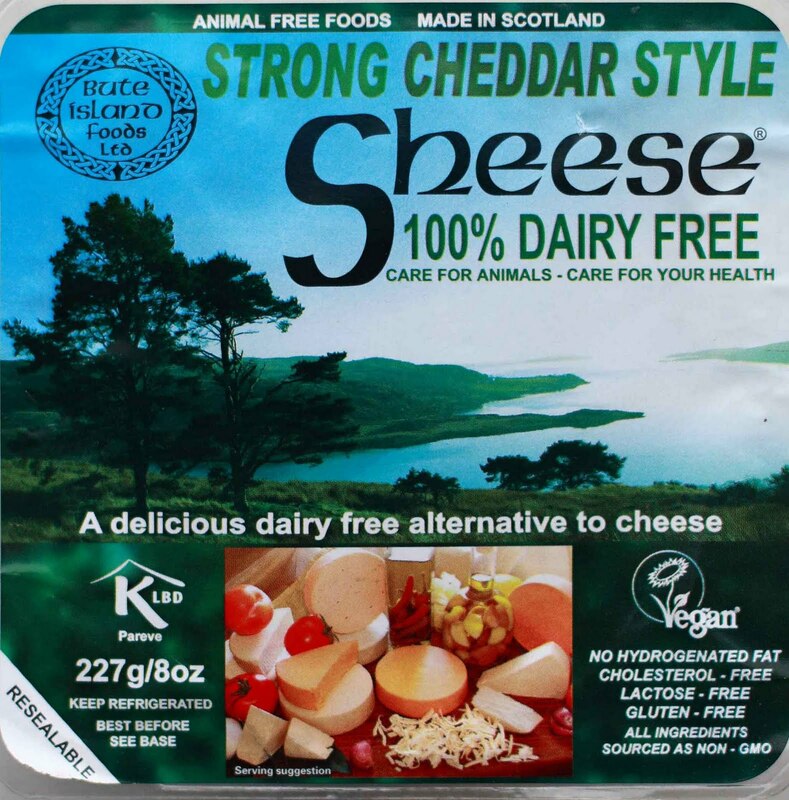 Note: Rice Dream Cheese Singles seem wonderful in taste and melting capabilities but that is because they are NOT Dairy Free - they contain casein (milk protein).. you may well ask what is the point!? - Get into the kitchen and start inventing! There are nut based cheeses available in other countries or possibly available to purchase in Ireland via the internet but you can try making your own too! I made cashew cheese which turned out to be a nice substitute for a soft cheese spread. My quest for good soup is a long one. Getting Dairy Free soup in Ireland has been a problem since I moved here way back in 1998 but if you search hard enough you can find almost anything. The bigger problem is the taste. 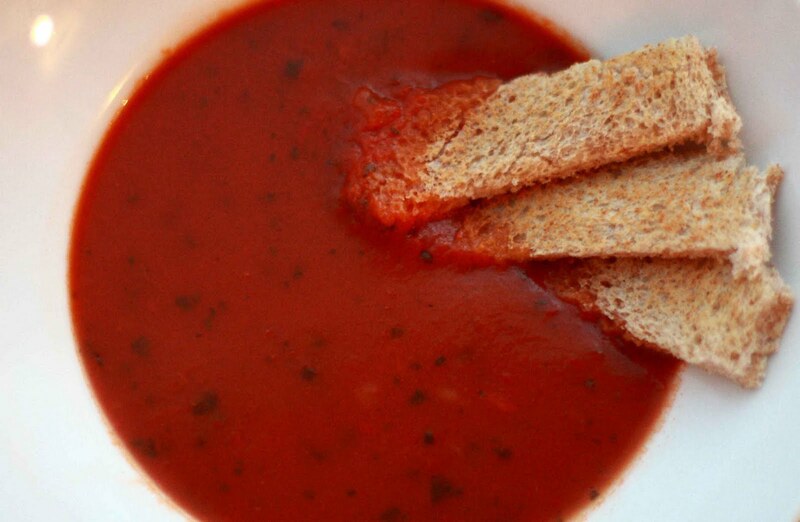 I thought that I just didn't like soup but I have discovered that what i like is a rich, hearty, thick homemade soup that doesn't taste like it came out of a can. 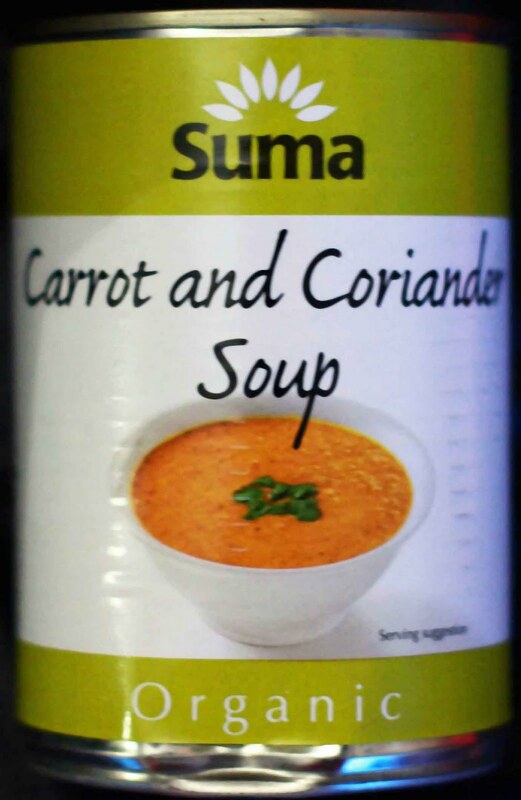 Suma’s carrot & Coriander soup is one of my favourite canned soups. Truth be told I am not, in the greater scheme of things, a fan of canned soups. They always have what I call an overriding ‘tinned-can’ flavour so when I say that I like this one I mean that it is thick and full of flavour and reminds me of homemade soup or a soup from Cornucopia which translates to Yum Yum Yum! -I am also an advocate for Suma’s Split Pea soup but that one contains Wheat and Gluten. 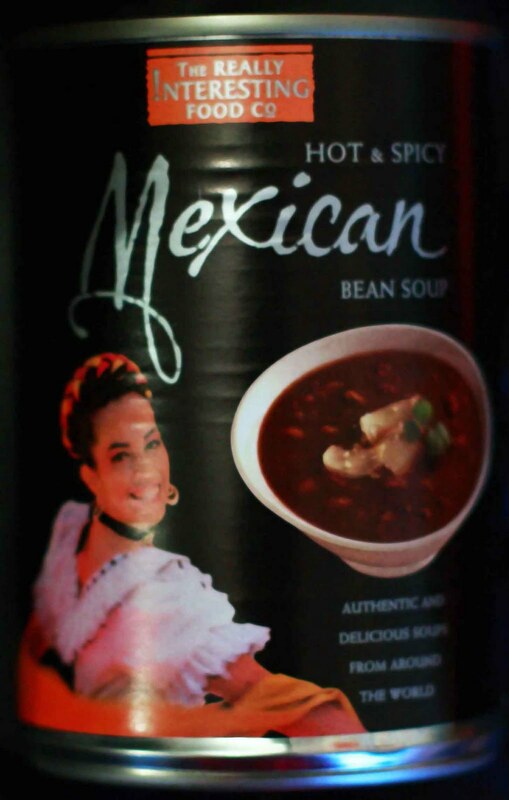 (Pictured in the title shot) Very spicy but not as hearty and chunky as the picture on the can would lead you to believe. It’s hard to get a Gluten Free and Dairy Free soup and I appreciate the availability but this one is a bit more typical for a canned soup (meaning that it has that famous ‘canned soup’ flavour) and doesn’t really urge me to write home about it. If you walk further south, beyond Rathmines village along Rathmines Rd Upper, past the park, you will come to a little cluster of what seems to be a Rathmines splinter group. There is a fresh fish shop, an off license, café, deli, butcher, hair salon and at 151 Rathmines Rd Upper, you will find the Field & Vine. The Field & Vine is a wonderful little gourmet grocers which covers everything you could want from A to Z be it flowers, fruit, veg or coal all the way to gluten free pastas, organic baby food, egg free mayonnaise and dairy free ice cream. I could, and sometimes do, roam the shelves for ages just to see if anything catches my fancy and something almost always does! The prices are in line with a gourmet grocer/health food shop which makes doing the full weeks groceries here a bit ambitious but the variety is remarkable. The Field & Vine carry Tyrells crisps, at least 3 types of Vegan flapjacks, Gluten Free Dairy Free and Egg Free cookies, nut butters, Dairy Free milks & cheese, fruit and vegetable juices, and even a salad bar which conveniently lists the ingredients of each tub not to mention spices and herbs (fresh and dried) as well as nuts and grains and dried fruit etc, etc, etc ... you get the point. Oh yeah, they sell wine too, as I’m sure you guessed! There is something for every dietary need here be it Vegan, Gluten Free, Sugar Free, Dairy Free, Raw or Detoxing. Some of the best stocked sections are listed below if you care to check the variety before you head down. Toasted Banana Sandwich: Best Allergy Free Snack, Ever! Since I can remember my mom made us toasted banana sandwiches and truly they are mm mmm good. I know that this is a ridiculously simple recipe ... so simple, that I feel like a phony even calling it a recipe but it is one of my all time favourite comfort foods, and what is life without comfort foods when you have food allergies? Even if you don’t like Gluten Free bread (which I can totally understand why) it’s failings are usually hidden when toasted, making a toasted banana sandwich is the perfect way to use the loaf. The bread used in the picture above is Juvela Gluten Free. The banana filling makes it so perfectly and gently sweet that this sandwich is ideal for anyone suffering from sweet tooth cravings while trying to resist refined sugar or added sweeteners, natural or artificial. 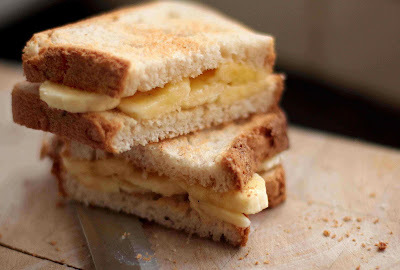 The banana mixed with the bread and butter substitute makes the sandwich wholesome, sweet but yet satisfying. Banana’s are good for you! http://thetaoofgoodhealth.com/6-awesome-health-benefits-of-bananas-9/ but be careful to not eat too many. I once heard that you should only eat one banana (or half??) every second day to give it time to move through your system and fully digest because it takes two days to do so. Fact or Fiction, I don’t know but erring on safety means that you can have 3 banana sandwiches a week - YUM!